2-CD/1-DVD boxed set (LP-size) with 108-page book, CD 33 tracks, playing time approx. 98 mns. 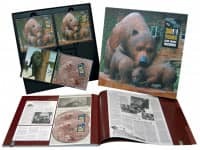 Bear Family Records – the name immediately conjures up a few memories, among them a very personal one connected to my radio work. For a broadcast story on Christian Broecking's book 'Respect!' and the similarly titled CD compilation, with a deadline looming, I went looking for Aretha Franklin's 1967 classic on this theme. I hoped to come up with some further thoughts regarding the political intention and the reception of Afro-American music. Making a quick check, I didn't find it in my well organized record and CD collection. A run to a record store? No time. I pored through my bookshelves, at last stumbling upon a huge boxset, the 'History of Pop Music,' a 52 CD collection issued in 1998 by Bear Family Records. There I found the sought after title on CD No. 44. It was included as part of a broadcast series, 'Roll Over Beethoven' aired by Radio Bremen between 1984 and 1986, complete with neatly documented notes. What a (re-)discovery! I could barely contain myself and immersed myself in this broadcast to such a degree that I almost missed my deadline. 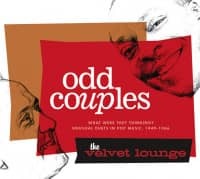 According to today's standards, this radio program would probably not pass muster in the arena of what's considered so-called legitimate public radio. Nowadays the balance between form and content has been steadily recast, and not necessarily in favor of the latter. What fascinated me most about this old broadcast, however, was the simplicity and clarity of the narrative by Klaus Kuhnke and Peter Schulze. They reminded me of what radio journalism, particularly features which concentrate on music, once had. Content! This was one of the reasons the 2003 German Prize for Record Commentary (Preis der Deutschen Schallplattenkritik) was bestowed upon Richard Weize, founder of Bear Family Records. Rendered in a somewhat rigidly phrased laudation, the award cites his "lengthy and innovative association with the sound-recording medium". In the music scene his merits were rather more loosely summarized. Here one hears more upfront talk of that "crazy German wandering around in American sound archives." 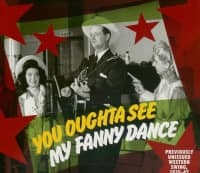 ,He has been characterized as "the eccentric with floppy trousers, ponytail and wire-rimmed glasses" who possesses a "weakness for comical hillbillies." ,Being a bluegrass music fan myself, I have been one of the most faithful Bear Family Records customers for a long time. In fact, the Bill Monroe box-sets are one of my prized possessions. And with his reissues of all the variations of popular music, Weize has made a worldwide name for himself. In my first conversation with him, in the summer of 1996, he quickly let me know with total sense of self assurance, "I'm the best." He said this with a twinkle in his eyes, quoting an old German proverb that among the blind the one-eyed person is king. "All I do is trying to deliver neat work. My goal is to always deliver the finest product possible." Indeed, thirty years after Bear Family Records' founding, Richard Weize is still adhering to his higher standards. I determined this when we met again in December, 2004 to speak about his upcoming anniversary. Weize will be remembered as the guru of the "extra large CD box-sets" and as a fanatic for thoroughness. He reasons, "It gives me great pleasure to document something in its entirety." An aspect of "…the manic compulsion of a collector to completely possess the work of an artist." ,When I glance at my own record collection, how well I understand this. Weize points to the 8 CD box-set 'Out of New Orleans' by Fats Domino as an example. He wanted to show not only what the man has done, but to shed more light upon its meaning. The sound document, as well as the accompanying book replete with tons of information and illustrations, are for him "a piece of contemporary history which your average fifty and sixty year old might still find of interest. But I also want to give the younger generation a sonic glance into that very unsettled time after World War II." Richard Weize certainly understands his role as an historian. The reasons for this can be traced back to his family history. Born in Bad Gandersheim in Lower Saxony, his mother 'bugged' him with her continual research into family and local history. "At that time, I laughed at her. Now I'm doing exactly the same thing with my own topics. Something, somehow, got inside me. I have follow-up questions for everything that I do. It doesn't feel right to me if I'm not totally on top of the subject." Here, the head of the Bear Family Records enterprise is both tenacious and relentless, qualities that are commented about in sound archives all over the world. In a few of these, he knows "the goods" even better than the person in charge. "Sometimes they call me up and ask where could this or that item be located? Then I have to explain to them how they should actually do their own work." For Weize history, in the broadest sense of the word, also means the documentation of the 'Schlager' hit-song boxes issued by Bear Family Records. This began with singer Ted Herold – "the only true genuine German rock 'n' roller". Through his mail order house, Weize sold over 700 Herold bootleg record copies. Thirty years ago that was quite a number. Adhering to the motto "one German record is not good, so let's make two", he went ahead and released an LP by Peter Kraus. It was pop at its purest. The retailers as well as the public wanted more. Weize fulfilled a demand for successive quotients and for his next release zeroed in on Caterina Valente whom he felt to be "perhaps the only German artist of global significance. Her German language material was simply put, rubbish. Her international material, however, was choice quality." Later on , Conny Froboes and Roy Black have been added to his catalogue, both of whom he would never have touched with a ten-foot pole earlier in his career. But today the 'Big Bear Boss' is the complete historian. Whether he personally likes the music or not, his purpose is to place German pop music in its historical context. "None of the German labels look at their past," he reproaches them. "They have limited themselves to releasing only the top of the sing-along hit parade successes." Weize wants to show the role the pop-song has played in postwar Germany. Lotar Olias, the discoverer of singer Freddy Quinn and one of the great pop song composers of the 1950s and early 1960s, told Weize just how important those pop songs were. Originating from East Prussia, Olias knew what role the concept of 'Heimat' (homeland) played in the pop song lyrics for the many millions of refugees from the East. To adequately portray those times poses an interesting challenge, says Weize. "One must provide a proper perspective for this through a wise choice of liner notes." 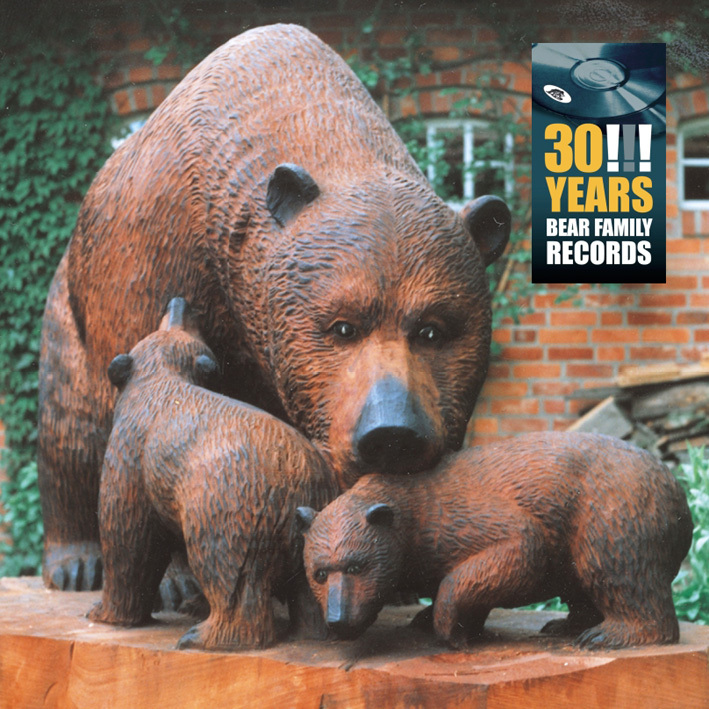 The Bear Family Records productions have not only achieved fame through their quality and musical documentation. Especially noteworthy are the books which accompany the box-sets. Their sheer size and content often spans one hundred pages or more. They are meticulously researched and edited, often containing rare illustrations and pictures from the period. Weize's addiction to completeness is evident in every last detail of the commentary in the discography, the artist's career, photos, correspondence, promotional material, memoranda, anecdotes et al. In the early years, his methods were often a bit lax concerning these materials. That is, until an embarrassing incident occurred. Weize had just completed his first box-set featuring Hank Snow and simply tossed away his research materials. In the middle of a discussion with a colleague, it suddenly dawned upon him that he could never have made this box if Snow had been equally lax with his materials. Since then everything is saved and archived even if it means the never-ending problem of finding enough space in his farmhouse. After 30 years, Richard Weize is still having fun with his task of preserving music history for future generations, and still with his own unique understanding of exacting, total completeness. "…to make it all accessible," as he puts it, "whether it interests anybody or not. At least it's all there!" For this kind of mission one needs someone as fanatically obsessed as him. He states, "In all areas of society, it's usually the people who are a bit off the beaten track who create the things worth preserving. Often it's those most difficult people who tend to get things done," he ventures forth, without naming himself or any others. He is thrilled that Family Bear does have a few "normal people," who pay attention to creating a healthy mix of commercial and non-commercial material. "A bundle of nerves." This expression comes up often, as Weize recounts how challenging it has been to produce so many box-sets. It often takes years, and more than a few of these projects have led to a few ulcers. While working on a planned box-set of recordings of many of the Lili Marleen song existing world-wide, a collector from the Czech Republic led him to a Czech version. Upon second thought, the collector decided he didn't want to part with the record and copied it onto a cassette tape. Unusable for Weize, long negotiations ensued. Why such torment? "Strictly speaking, I do this for myself. Otherwise I probably wouldn't even bother." ,His pleasure is soley derived from documenting the achievements of others. "If you think about it, in comparison, I'm not really doing anything here", says Weize. He refuses comparisons with other tireless collectors in the service of music, his predecessors who have entered into the lore of music history such as the folksong collector and researcher Alan Lomax. "That is someone who trudged into mountain villages and snatched music right out of foxholes. My situation is a lot easier. I simply sit at home and work with the material that other people have created." In fact, I think this alone is an amazing achievement! Particularly now, at a time when historical background and social context are almost non-existant in the media. Richard Weize knows this. "One can barely listen to something on the radio today, with the exception of Deutschlandfunk and DeutschlandRadio Kultur. Naturally, there are a few good broadcasts on other stations. However, they are carefully hidden programs and they are in a minority." Weize laments "the superficiality of our society", bringing with it a change in the listening habits of the masses. He knows that hardly anyone has the patience to dig beneath the surface of a music title anymore, let alone to get to know even a bit more about its history. As further evidence of the prevailing "here-today-gone-tomorrow" attitude, Weize refers to the development of the hit parade. "The days are gone when an artist like Elvis Presley could remain at the top of the charts with one song for months at a time." ,He quotes his German-American friend and colleague at Arhoolie Records, Chris Strachwitz, who ruminated on the history of the vinyl record with a slight air of resignation, "We had a good hundred years." Weize gives the CD another five to ten. At that point, he forecasts, the clientele for his products will probably be too small for him to continue financing the entire enterprise. But even while the future looks gloomy for Bear Family Records's exquisitely nurtured gems, Weize is proud to have stayed the course for so long. He takes great pleasure in knowing that so many people treasure his work. The many e-mails and letters he receives, "spur me on to continue further, for as long and with as high a level of excellence as possible." ,Weize softens a little at certain rememberances. He speaks gently about Brenda Lee who thanked him for his production of 'Brenda Lee – Little Miss Dynamite' box-set, stating that with it, he had preserved her life for her children. With a touch of melancholy, he tells of the famously laconic Johnny Cash, who praised the many Bear Family Records productions of his work as "the best ever produced about him." He is especially moved by a postcard he recently received from Pete Seeger who had contributed a few lines in the accompanying book for the new box-set 'Uncle Dave Macon – Keep My Skillet Good and Greasy'. "With a few words he thanked me for allowing him to work together with me," something of which Weize is rightfully proud. Richard Weize still has an abundance of ideas and themes waiting on line for his attention. Although he states "I have actually done just about everything that has been important to me," there quickly follows a postscript, "…but there are always more things that one can do." Two projects that he would still like to see completed are box-sets containing the works of Woody Guthrie and Pete Seeger. "Their songs still have so much spark, in spite of the overwhelmingly simple or often just plain bad level of recording." Already in production is a history of the German Festival at the Burg Waldeck, as well as the recording sessions of the actress and singer Gisela May from Berlin. And for fans of country music, Weize is taking on the Dixon Brothers catalogue. I even received a videotape, introduced to Americans in the 1950s, in which one sees a turtle with the motto 'Duck up and cover', demonstrating how to cover your head with a blanket to protect yourself in the event of a nuclear bomb attack." Weize now says furiously, "This was shown to school classes! You would think such things could only be satire. Just like today, when one listens to President Bush speak. Only it's not satire", he says with out-and-out indignation. I can´t wait to hear this! Among my personal Bear Family Records favorites is another topical box-set 'Songs For Political Action'. 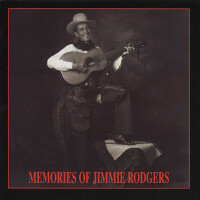 This collection is truly the ultimate source on folk music and the political left in the United States from 1926 – 1953. A few days ago, a colleague called and asked me where he could find a provenance for the text of the American labor ballad, Because All Men Are Brothers, sung to the tune of Bach's famous choral O Sacred Head Surrounded (O Haupt voll Blut und Wunden). I knew exactly where to look. Where else? On page 154 of 'Songs For Political Action'. Thank you Weize! And many happy returns! English translation by Michael Spudic. English edit by Nora Guthrie. 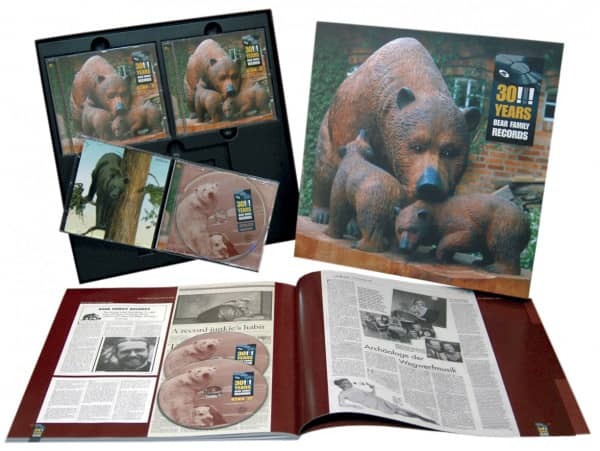 Customer evaluation for "30 Years Bear Family (2-CD & 1-DVD Boxset mit 108-seitigem Buch in LP-Grösse)"